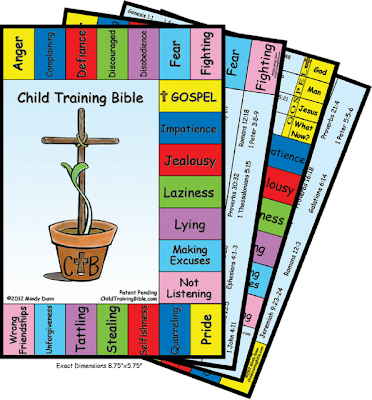 The Child Training Bible Kit is a set of 4 laminated cards that allow you to mark your own Bible or one you purchase just for this purpose. I purchased this Bible for $9.99 which I am very happy with. It took me a few hours to get my new Bible all set up and it was a blessing to do it. This kit would make a wonderful baby shower gift or gift for any parent. You could set it up for whoever you are giving it to but I am glad I had the opportunity to do it myself. My Child Training Bible completed with all the tabs. As mentioned the CTB kit comes with 4 laminated cards. The cards are sturdy and look like they will hold up over a long period of time. The first card is the key that you tape using double sided tape to the inside cover of your Bible and makes it easy to find the verses for each "offense". The remaining cards called tabbers are printed on both sides. The first side lists the Bible verses for each tab and is used to help you set up your Bible. The opposite side is divided into 3 sections. The first two sections have questions to help open up the discussion after reading the scriptures and the third section contains prayers with scripture that you can pray with your child at the end of a training session. You can clip these cards inside the back cover of your Bible with a binder clip or make a pocket to slide them into. Inside the Bible. Verses are highlighted. I found that with some of the darker colors it was better to underline rather than highlight. The Bible I bought has lighter ink so it might just be because of that. This video is a great overview of what the Child Training Bible is, how to put it together and how to use it. 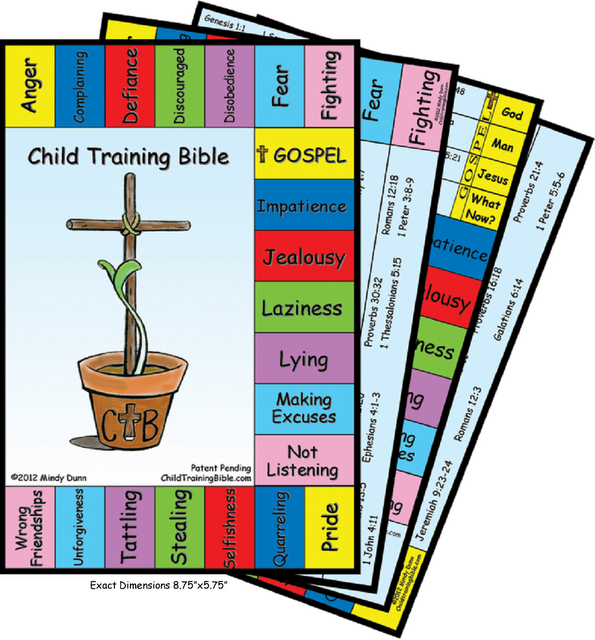 You can purchase your own Child Training Bible kit for $9 plus $4.99 shipping for up to 2 kits. She also offers discounts for orders of 10 or more. You will also need a 9"x6" Bible, post it flags and highlighters to complete your kit. Product suggestions can be found on the CTB Order Supplies page. Visit the Child Training Bible website to learn how it came into existence and more about the creator. I am so excited to be able to give away on Child Training Bible kit through the generosity of Mindy at The Child Training Bible. This giveaway ends on Friday, June 29 at midnight, so enter now! Winner is Katrina B! Congratulations! (Contact has been made.) Thank you to all who entered to win. I would encourage you to follow Child Training Bible on facebook (other giveaways are posted) or just BUY your own kit! This is my first Rafflecopter giveaway. It seemed easy to set up so I hope everything is working properly. disclaimer: I was given a free Child Bible Training Kit in exchange for an honest review. I assume you only need one . . . not one for each child? It looks pretty neat. I have been seeing a lot of posts about this lately and I would LOVE to do this with my kiddos! Never heard of this before but it looks fantastic! Thanks for sponsoring this contest! I recently learned about the training Bible and love the idea. I would like to try it out for our 4 kiddos! I too am doing a review and giveaway at http://christicrazylife.blogspot.com/ I'd like to all your link! This would be a wonderful tool to have right at my fingertips for my children. I absolutely adore this idea, and would love to win for my 6 year old who enjoys reading the Bible. He could really benefit from being able to quickly find a verse on a specific subject! Thanks for the giveaway! I keep hearing such great things about the Child Training Bible and REALLY want to implement it in our household! I would love to win this! This would be such a great tool to use with my kids. I want to use scripture during those times in need & this would be a wonderful way to do so! I would love to win this. Also thinking it would make a great "door prize" at our Mom's Night Out event. I have one of these and LOVE LOVE LOVE it. 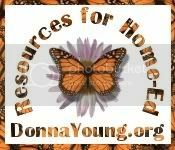 I would love to win this to share with my homeschool friends. It looks like a great teaching tool. I would love to win one of these for my 2 girls. We have entered many contests to try to get one. I hope we win! This looks great! It would be wonderful to have the scripture verses ready to go, instead of having to stop and research an appropriate verse every time a child needs correction. It would be great to have ready-answers to tough situations! This looks great! This will be a tremendous blessing for our family! Thanks for the opportunity to win this awesome resource! I'd love to win one. I am also currently reviewing this kit this summer. I would love to win another copy so that I can gift it to a friend as a baby shower gift. Thank you for posting this giveaway. I recently started hearing about this bible and have wanted to get my hands on one ever since! 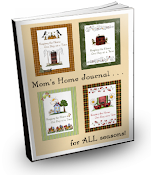 I think this would be so helpful for our family! We are trying to memorize verses with our little ones, but there are moments when I don't have the verse on the tip of my tongue or a training moment comes up that I don't have a memorized verse for! This would be a huge help! I think it would be fun to put this together. Thank you for the chance to win. How can I order this now?